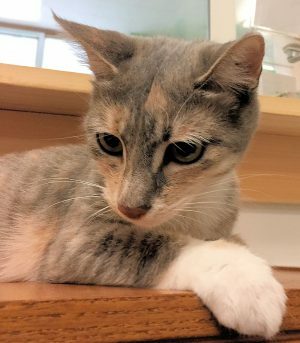 OSWEGO – Our sweet princess, Trinket, would love to tell you all about her amazing adventures. She was once lost, alone in the world with no one to care for her. A kindly person gave her food and shelter, and made sure she wasn’t sickly. She showed her appreciation with leg-rubbins and noggin nuzzles – and those haven’t stopped yet! Trinket is ready for a forever home. She is about 2 years old, spayed and up-to-date on her vaccinations. She gets along well with cats of all ages, and probably wouldn’t mind a dog around if she got to meet them first. You are welcome to email us your inquiries anytime at [email protected] or call our office during business hours at 315-207-1070. Will you be the “happy” to Trinket’s ending?